Missouri S&T professor Fateme Rezaei, left, and student Harshul Thakkar demonstrate their work to develop technology to help keep astronauts safe from carbon dioxide buildup. 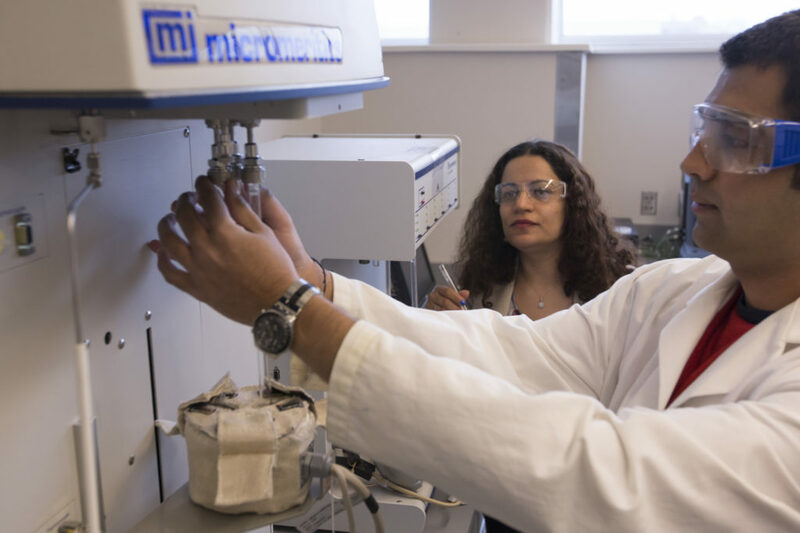 Dr. Fateme Rezaei, assistant professor of chemical and biochemical engineering at Missouri S&T, and the team have developed “robust structures” in mechanically strong configurations that are comparable to powders in adsorbing CO2. Their findings were reported in the American Chemical Society’s Applied Materials & Interfaces publications in September 2016 and February 2017. Besides keeping astronauts safe, the technology can improve the reliability and efficiency of current CO2 removal systems. The work also could lead to the development of cost-effective and energy-efficient adsorbent systems for purification of other gas streams. Industrial gas separation processes include natural gas purification, olefin/paraffin separation and hydrogen gas separation. Results indicated that 3-D printed monoliths with high zeolite loadings show adsorption capabilities comparable to that of powder sorbents, she says. The adsorption capacities of 5A and 13X monoliths were 1.59 and 1.60 millimol per gram, respectively, using 5,000 ppm (0.5 percent) CO2 in nitrogen at room temperature. The experiments show relatively fast dynamics for monolithic structures, Rezaei says. The printed zeolite monoliths show good mechanical stability that eventually can prevent attrition and dusting issues that are encountered in traditional pellets and beads packing systems. “The 3-D printing technique offers an alternative, cost-effective and facile approach to fabricate structured adsorbents with tunable structural, chemical and mechanical properties for use in gas separation processes,” she says. In the study published in February, the team then made other types of CO2 adsorbent monoliths with the same 3-D printing method. The monoliths were fabricated using silica supported amines (aminosilica). This class of materials has shown promising performance in capturing CO2 from gas streams. Like zeolites, 3-D printed aminosilica adsorbents exhibited similar adsorbent characteristics to their powder analogues. The amount of CO2 removed by each honeycomb depends on its “adsorption capacity,” Rezaei says, which is defined as a millimol of CO2 per kilogram of the adsorbent. Carbon dioxide removal by the monolith is a cyclic process, which means that once it is adsorbed and the monolith is saturated, it should be heated to remove the adsorbed CO2 to start the next cycle. These approaches are very scalable in comparison to beads or pellets, Rezaei says. For the PEI and TEPA aminopolymers, direct extrusion of the premade materials into a monolith was found to be the best way to formulate these adsorbents. For APS, post-functionalization of a bare silica monolith was a workable strategy for their formulation. Researchers on the two papers were Harshul Thakkar, graduate research assistant, and Stephen Eastman, undergraduate research assistant, in the chemical and biochemical engineering department at Missouri S&T. James C. Knox of NASA’s George C. Marshall Space Flight Center also contributed to the September paper. What if there was a way to mass produce plant photosynthesis artificially so the earth’s atmosphere is scrubbed to reduce levels of Co2. Where the chlorophyll is produced chemically, a mechanism is developed replicating the plant process of photosynthesis via sunlight and concentrated Co2? What would happen if concentrated Co2 is exposed to electrical arcing, fuelled by solar panel collectors?